We connect people to nature and host the talented teams of the best companies in the world, showing them the wealth of nature that is found outside their office’s front door. The philosophy – Go wild, rewild! We provide companies with a range of opportunities that help ‘rewild’ your staff, a process which leads to enhanced physical and mental wellbeing but also improved productivity and social cohesion amongst teams. 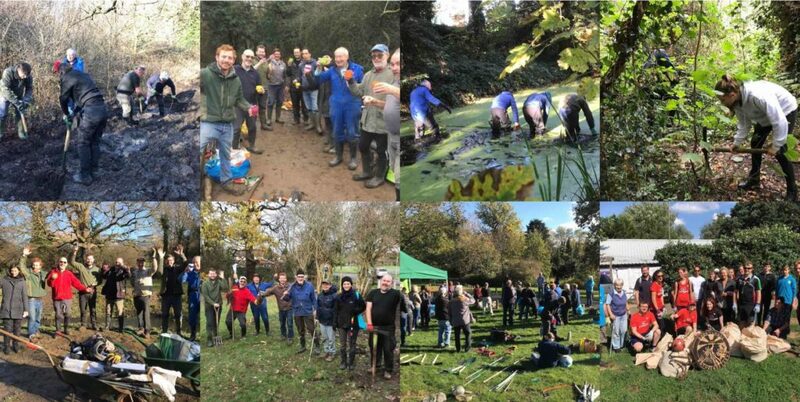 These opportunities also equip teams with the tools necessary to help rebuild their remaining green spaces for the benefit of wildlife and the local community. Each WILD lunch or WILD day is developed bespoke to your needs, so prices vary according to numbers, activity type and length of session, get in touch to find out more! An exciting day out for your staff, where you’ll learn about the beauty of the natural world around us, with engaging walks and talks throughout the day bespoke to the environment in which you are working. We’ll provide you with a range tools before setting you to work on one of our rewilding reserves, to rebuild vital habitats and functional ecosystems. Choose from a number of different locations, all of which support different habitats and species. Need us to provide food too? We understand that an army marches on its stomach, and can ensure that your team doesn’t go hungry! Thank you for taking the time to come to the studio on Monday. The team was also delighted to have you with us and I’ve also heard so many great comments! It would be great if you could join us again! I loved it! It was a really fun day not only because I care about nature but because also as event it was very down to earth. The Citizen Zoo team were really good at talking to people and it’s a very personalised day. It doesn’t feel like something that anyone else is getting. I’m incredibly impressed by the enthusiasm and expertise of Citizen Zoo. Above all, their emphasis on fun and collaboration. I immensely enjoyed learning about the local flora and fauna that as a local I had taken for granted. It is very interesting expanding my knowledge of nature and the methods of preservation utilised in London. The event rekindled my fascination with nature and promoted a team building experience. I had a lovely time and hope to interact with Citizen Zoo in the future.